Whole grain mustard is a staple in my fridge and my kitchen. We enjoy it as a sauce, as in this mustard vinaigrette with green beans, or sometimes I catch myself even mixing it into food to give flavor to a dish (I like it will lentil soups!). 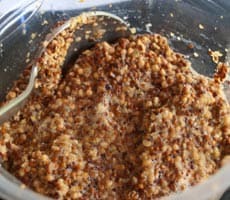 Learn how to make homemade whole grain mustard with my recipe and follow the photo instructions below. The mustard seed is one of my all-time favorite spices. That might be because my European roots use the yellow seeds commonly in pastes and also because my husband’s traditional food culture uses the brown and darker mustard seed versions in the Indian cuisine. Yet, I have noticed that the mustard as a spice has often been overlooked and forgotten. The fact that we commonly buy our mustard pastes ready made in the Western world, got us so far that the mustard seeds almost disappeared in the grocery store shelves and in our kitchens. On the other hand, Indian food tradition still uses the mustard seeds, oil, and even the leaves. These are essential ingredients in the food culture of the subcontinent. Especially in West Bengal where the mustard spice makes a daily appearance in local food. However, In the Far and Near East, dark brown and black mustard seeds are more commonly available. In the Western world, bigger yellow mustard seeds are a common sight! Yet, of course, ready-made mustard pastes in different variations are most popular such as the classic French Dijon mustard paste, the French Dijon whole grain mustard or the bright yellow English mustard paste. Whole grain mustard is mostly associated and known as whole grain Dijon mustard (from Dijon city in Burgundy France) or moutard á l’ancienne in French. Yet as a side note, whole grain or grainy mustard pastes, in general, can be found all over the world in different cuisines. AND there is also a popular ground (non-grainy) Dijon mustard variation. 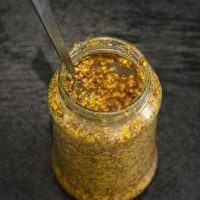 In this post, we will focus on the whole grain dijon mustard since this grainy mustard recipe is a dijon copycat recipe. It is common knowledge that the making of Dijon mustard, that might be the whole grain or ground mustard, is a science and highly secretive recipe of the region in France. Therefore, Dijon mustard received a protected label in the late 1930s. That means the production has been strictly watched and limited to the region of Burgundy. That means this whole grain mustard recipe and any other whole grain dijon style mustard is a copycat recipe and can never be sold under the name of dijon mustard. So this special protection is just another reason why generally speaking dijon mustard and any other mustard in this world are not the same. What is the difference between whole grain mustard and ground mustard? The main difference is the mustard grain smoothness. Besides that, Whole grain mustard paste is much milder compared to ground mustard paste, all the grainier and contains mostly a mixture of yellow and black or brown mustard seeds. I repeat, Whole Grain mustard is often associated only with the city of Dijon which is part of the French region of burgundy heritage. The truth is many different varieties of grainy mustard pastes exists all over the world. 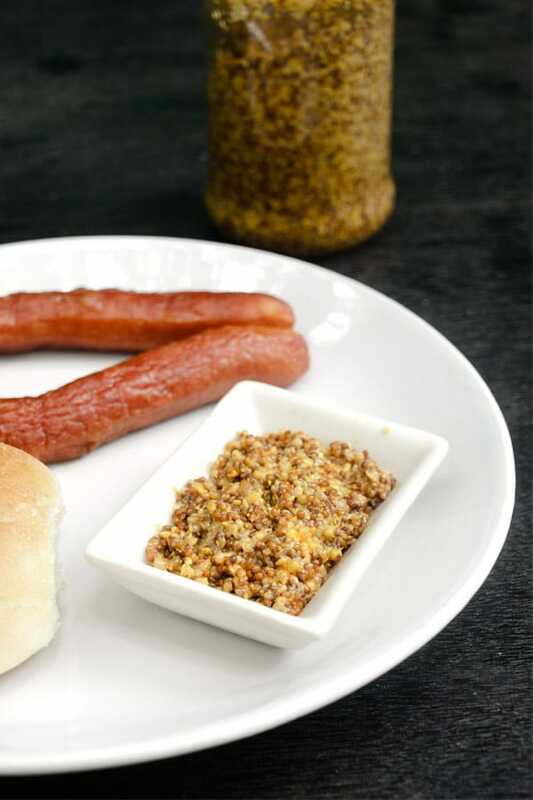 On the other hand, ground mustards are widely known in different parts of the world. As explained earlier, there are generally speaking 2 main different French mustard variations from Dijon one being the grainy mustard and the secondly the specialized smooth yellow ground mustard which is widely known as French mustard globally. What is the difference between ground French Dijon mustard and any other French ground mustard? What is mustard made of? 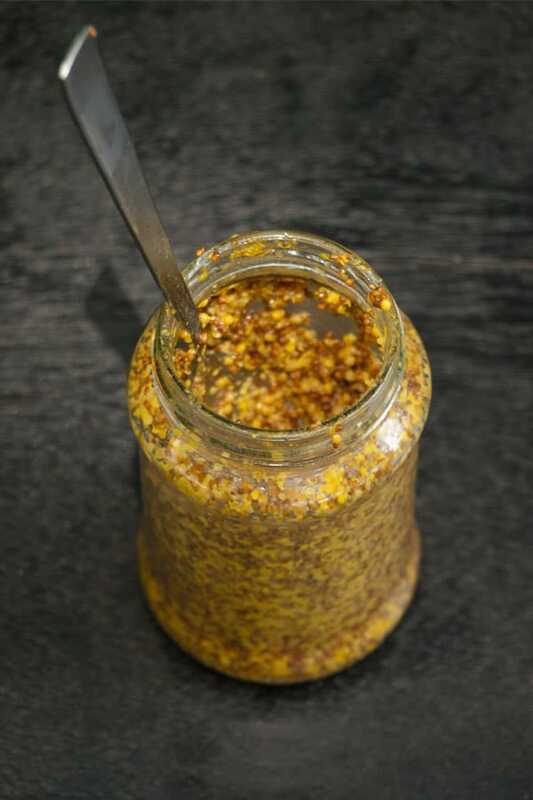 It is known that the yellow mustard seeds for the ground or whole grain Dijon mustard paste are collected from a certain yellow mustard type and the seed’s “skin” is partially removed. The paste also goes through some kind of fermentation and the acidity is added with verjuice, a highly acidic juice made by pressed unripe green grapes grown in that region in Burgundy. Whereas OTHER French regional whole grain mustard recipes include White wine Vinegar and the procedures and ingredients are different as well. Some recipes include even flour and certain spices such as cumin and turmeric. In fact, other, non-dijon mustard pastes which are part of the gourmet mustard paste heritage in France include the green pepper mustard and the blackberry mustard paste. Both are smooth ground mustard pastes. Foodrepublic.com has got a great mustard comparison here. Mustard seeds and especially the yellow variety grow in the Mediterranean area from a small plant into a shrub. The yellow mustard seeds are mostly commercially grown in big quantities in Canada, Russia and East Europe such as the Czech Republic and Hungary. Dark brown and Dark black mustard seeds are grown in and around the Himalaya region, which includes Nepal, Pakistan, India, Myanmar, and China. What do mustard seeds taste like? The yellow mustard seeds are often bigger in size, easier to crash and they do have a bitter aftertaste. The brown & black mustard seeds are smaller in size, harder and I believe a bit less pungent compared to their yellow counterparts. Did you know that mustard seeds contain a whole lot of essential oils and proteins? At the same time, the seeds have been known in ancient times for their versatile and powerful illness cures. Today mustard seeds are still used as a digestive and it has some useful disinfectant properties. How to make Whole Grain Mustard Recipe Dijon-style/copycat paste at home from scratch? 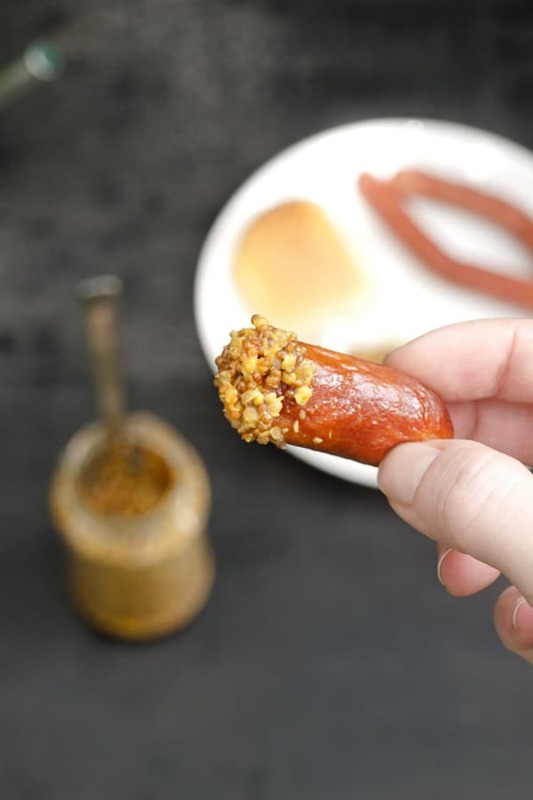 When you make the whole grain mustard condiment, keep in mind that it needs 4-5 weeks to rest before you can enjoy the grainy mustard paste and consume it with your meal. The longer you keep the seeds to rest/marinate the more flavorful it will be at the end. In my recipe, I have used White wine Vinegar instead of Verjuice and the yellow and dark mustard seed ratio is at 1:1. Brown and Yellow mustard seeds can be easily purchased online or otherwise look out for mustard seeds in your nearest organic store or ethnic neighborhood grocery store. In this whole grain mustard recipe, I added a bit more Turmeric powder then what they would add in France. I did that because I live in a humid moldy environment. So that the condiment survives longer I chose to add more of the antifungal and antibacterial yellow turmeric (Curcuma) spice. You can adjust the amount of turmeric you would like to add to your copycat dijon mustard paste. The flavors don’t change that much. The color is the main difference and makes the mustard paste to pop out more. The paste can be stored in a dry and cool place for months. I usually store the grainy mustard pot in the fridge. A flavorful tangy bright whole grain mustard recipe, easily made from scratch! Based on the French Dijon mustard making it a copycat whole grain Dijon mustard recipe. You can adjust the amount of Turmeric powder in the recipe by omitting it completely or by reducing the spice. Turmeric has anti-fungal properties which help in the conservation of the whole grain mustard. Besides that, turmeric will give the whole grain mustard paste a bright lovely pop of color! Add to a bowl your yellow and brown Mustard seeds and cover them with 80 milliliters of the White Wine vinegar. Let it stand for at least 1 hour. You will notice that the vinegar will bubble a bit when it comes in touch with the mustard seeds, that's alright. We want the seeds to get a bit soft. Next, we will pound the seeds and if they have lost a bit on liquids, then add about 1-2 Tablespoons water to the mixture. 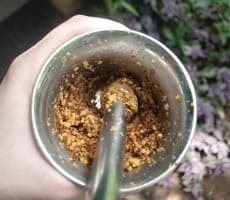 To pound with the pestle add always small batches and smash and twist it so long until most of the yellow seeds have turned into a mush. The brown once don't crack that easily but with the pounding, they will crack a bit and emit the flavors. Do that with the remaining mustard seeds. In a bowl with the smashed mustard seeds add the remaining 40-milliliter vinegar, lemon juice, salt, pepper, and Turmeric powder. Mix the content well and fill a clean jar with the condiment. Add the Oil on top and close the lid. You will need to let it stand for minimum 4 weeks before you can use it. That is the grainy mustard paste will need to ferment a bit or let's say the flavors "get used to each other" and form the superb flavor we love so much in the whole grain mustard. Let it rest and then you can enjoy it! Dear Reader, how did you learn about whole grain mustard dressing? Has it been part of your life all along? Please, feel free to share with us your thoughts further below in the comment section. We love hearing from you! The post Whole Grain Mustard, was first published on January 26t, 2015, and has been updated and enhanced ever since! I have never considered making my own mustard, which is strange now that I think of it, this looks possible! I find dark and yellow mustard seeds here, and have been infatuated with them ever since I discovered a roasted cauliflower recipe that uses them. I will absolutely make this mustard Helene! No matter how long I have to wait. Time flies by anyway. Oh, how I would love to join you on that Mustard Trail! I’m a huge fan of whole grain mustards…my favorite…and yours looks just perfect, Helene :). I never thought to make my own mustard and I love mustard, how silly of me! I really dig the fact that it has healthy oils and proteins, I had no clue. I make mustard from time to time just for fun, but I’m lucky in that I can buy many different types of already prepared mustard. Yours looks fabulous – really nice. Thanks so much. JUST beautiful. I am a mustard addict! And I’ve always wanted to make my own! Thanks Helene! Oh I love mustard too and my mom uses the yellow seeds (available in Delhi) in her Fish curries! 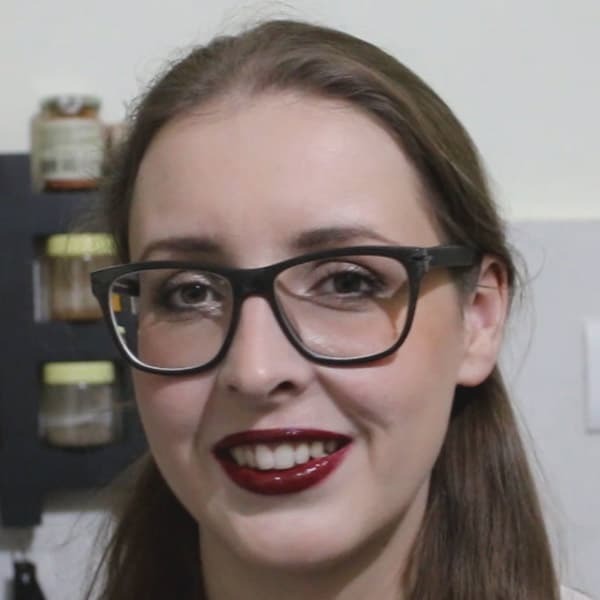 !I love grainy mustard with my hotdogs and this recipe sounds amazing Helene!! Nothing like a homemade condiment to enjoy with your foods.And its healthy too! I eat a grainy mustard nearly every day AND I’ve been dying to make my own mustard since receiving some as a gift! You are an inspiration, Helene!!! We are major mustard snobs! I have a bag of mustard seeds just waiting to be made in to mustard… someday! Yours looks amazing. I love this, Helene! My favorite sandwich condiment is moutarde a l’ancienne, which I buy at the French chain hypermarket, Carrefour. And because I do a lot of curries, I always have brown mustard seeds in the spice rack. It never occurred to me that I could make my own mustard! So silly when I think about it. I can’t wait to give this a try! Thank you! I love *any* mustard! And mustard seeds… we used to buy a fancy one downtown but I’m definitely going to make it now! Bravo, Helene! Your mustard rivals those of the Dijon dynasty =) Love the tang of turmeric. This is one condiment that I haven’t seen made from scratch. I love a good whole grain mustard! Thank you for sharing! For me, it was just the reverse…I had no clue mustard was so widely used outside of Indian cuisine. In Bengal, we use it extensively, from seasoning to paste, and traditionally a sauce is prepared that is called ‘kashondi’. This looks similar, and I would love to have a taste of it. Great post! Helene, whole grain mustard is one of my favorite condiments — never thought to make it though. Thank you so much for the recipe! That last photo says it all. So true about the great variety of mustard found in Europe. I would love to have that selection here in the US. There are some German mustards that are one of the highlights of my visits there and I bring back as much as I can in my suitcase. I’m so glad you shared a mustard recipe and if I ever do make my own mustard this is the one I would start with first. And here’s the mustard! You know, I really thought the recipe for mustard must be more involved than this… it seems quite simple actually. Of course, now I need to find some mustard seeds… not that common but I’m sure I can find some somewhere. Looks lovely Helene – and really colourful too! I have mustard seeds and keep thinking I’m going to make whole grain mustard but haven’t done it yet. You make it sound pretty easy and the recipe sounds great so I’m going to have to try it! Mmmmm, Helene that looks divine! I eat eat wholegrain mustard most days for breakfast, on toast with a poached egg on top. I love it! Love this Helene. Must make some soon. My Dad has some green grapes on the vine. Maybe I should get a little adventurous. Wow, thanks for all the helpful tips! I never considered making my own mustard, but now I just might! And I agree, mustard is kind of a forgotten spice! I have never ever been brave enough to try my own whole grain mustard but you make it seem so easy. Love whole grain mustard in sauces and dressings. We used a Creole mustard at work that was whole grain. Yum! I bet this mustard is better than anything you could buy! Definitely could see dipping some tiny sausages in this. I had no idea how whole grain mustard was made so thanks for sharing this. I like to learn how food is made from scratch and this one was fun. I never thought of making whole grain mustard from scratch and really interesting to know the process, Helene! Now I’m ready to eat sausages with this! Should this recipe be put in sealed jars and left out or should it be refrigerated? Best way to preserve is sealed in jars and stores in a cool dry place such as the fridge. Hope that helps! Does this recipe need to be put in sealed jars or should it be refrigerated? I would love to make my own whole grain mustard. I have bought it before ready made, but this sounds much better. At least I would know what is in it. Wow. Wow. Wow. Wow. How did I miss this?! You made mustard from scratch?! How fantastic. Looks just incredible. Goodness! This is so mouthwatering. I like it as a condiment with rice. Thanks a lot for posting this wonderful recipe of the whole grain mustard paste. Loved the pics. So vibrant and mouthwatering. WOW! This is such a beautiful and useful post. Bookmarked! Hi Helene, your mustard looks just like the real thing, I bet this is way more delicious than store bought. Do you let this stand in the fridge or at room temperature? If you live in a cold country then you can leave it outside to stand in a cool and dry place. Something like a cool, but dry, cellar would do too. Just make sure to close the jar with the lid well. Try to avoid the fridge if possible, it dries up the mustard but if you don’t have a cool and dry place, then this is the last option. Usually I keep it out in the tropics too, but in a dry, cool and dark place. The turmeric, mustard seeds and vinegar have anti fungal properties, so it will keep the mustard mold free. This recipe looks excellent. Can I just ask about the oil to pour on top – is it to keep the mustard moist so can be poured off or should it be stirred through after fermentation for serving? The oil helps to preserve the grainy mustard and it does give some moisture. You will see that after 4 weeks there won’t be much oil left anyway. Basically, to answer your question, you can just stir through and your whole grain mustard will be ready for you to use it. Oh man, I am a spicy mustard lover. Why the heck haven’t i thought to make it myself? thanks for the recipe! Has anyone actually made this? Lots of “can’t wait to try it” and “sounds terrific” comments, but nothing about it actually tasting any good. Is it bitter? Lots of home-made mustard recipes turn out impossibly bitter. I love dijon mustard – I’ve never imagined of making it at home myself though. This is definitely inspiring! Thank you so much for sharing! Hi, this may be interesting you: Whole grain Mustard Recipe - French Moutarde à l'ancienne [EASY DIY]!